The varroa mite, Varroa jacobsoni, is considered to be the most serious honey bee pest which now occurs almost worldwide. Normally, unprotected honey bee colonies will die from the effects of varroa within one to two years. So, it is imperative that beekeepers become familiar with and apply the latest varroa mite control recommendations. The varroa mite’s natural host is the Asian honey bee, Apis cerana, and it seldom reaches a destructive level in this species. Varroa mites were found on specimens of Asian bees collected in 1942 and are stored in Museum Moscow. Varroa mites were first discovered in the same USSR region on European honey bees, Apis mellifera, in 1964. A rapid and multidirectional spread of the mite occurred within the USSR. Varroa was first detected in West Germany in 1977. The mite continued to spread and is now found throughout the world within the natural limits of honey bee distribution. In September 1987, varroa mites were first discovered in North America in honey bee colonies located in Saukville, Wisconsin. Shortly after this initial find, varroa was discovered in Florida. By the end of October 1987, varroa had been found in 19 of Florida's 67 counties. By spring of 1988, the mite had been detected in 12 US states. Varroa mites can be found on adult honey bees, on the brood and in the hive debris. The adult mite has eight legs and is reddish brown, oval and flattened in shape. Their flattened body confirmation allows them to hide between the bees abdominal segments and go unnoticed by the beekeeper. The adult female is about 1.1 mm long and 1.5 mm wide; it can be seen easily with the unaided eye (about the size of the head of a common pin). Male varroa are considerably smaller and are pale to light tan in color. When brood are present in the hive, an adult female mite will enter an uncapped larval cell (5-5.5 days old). After the cell is sealed, the mite will lay approximately five eggs. Egg to adult stage requires 5-6 days for male mites, and 6-7 days for females. The nymphal stages feed on the developing brood, often causing deformities in the developing bee. The old female and the newly mated female mites exit the cell as the young honey bee emerges from the cell. Adult honey bees serve as an intermediate host and a form of transportation for the newly emerged mites. Male mites and any immature female mites are left behind in the cell to die. Life span of varroa females is reported to be 2-3 months in summer and 6-8 months in winter. Mite populations increase rapidly during the heavy brood rearing season. Drone brood are parasitized more than worker brood. Bee colonies usually die from varroa parasitism in mid-summer to fall. This late-season die-off period (including unmanaged wild colonies) may lead to infestation of nearby colonies through robbing or drifting bees that abscond from the collapsing colonies. Varroa infested colonies may die with full supers of honey left behind that are subject to destruction by wax moths. Beekeepers can safely extract uncontaminated honey from dead colonies prior to ant or wax moth infestation. Varroa mites have piercing and sucking mouth parts and feed on the fat body of honey bee adults, larvae and pupae. In heavy infestations, pupae may not develop into normal adult bees and several mites per cell (five mites or more per pupa) may result in death. Adult bees that emerge may have misshapen wings, deformed legs, shortened abdomens, and may weigh less than mite-free raised honey bees. These heavily infested bees may be found in front of the hive, unable to fly. Other symptoms of heavy mite infestation include spotty brood pattern and the appearance of a weak colony with low morale. Low mite infestations are difficult to detect without a thorough survey. Varroa mites can live only a few days without a meal from an immature or adult bee. Equipment that has been stored free of brood and adult bees for two weeks or more may be reused without fear of mite survivability. Varroa mites are spread from colony to colony by drifting bees, especially drones. Other means of mite spread are bee colony movement for pollination or honey production. Mites can also be spread with package bees, queens, and swarms. Unless special measures are taken to survey for varroa mite levels, the beekeeper may treat colonies unnecessarily or may delay treatment too long. Infested colonies may appear to be apparently healthy up to a certain mite level, but will suffer a population crash at a certain mite threshold, depending on local conditions and other factors. A beekeeper should choose an effective method of mite detection and periodically survey for pest level. When sampling for varroa, remember that the number and location of mites in a colony vary according to time of year. The number of mites is lowest in spring, increase during the summer, and is highest in the fall. During spring and summer, most varroa are found on the brood. In late fall and winter, most mites are attached to adult worker honey bees. To get a reliable estimate of the varroa density in an apiary, beekeepers should survey at least 50 percent of the colonies. There are several varroa mite survey methods available to the beekeeper. Brood Examination - Varroa mites spend most of their life cycle inside sealed bee brood cells. Uncapping and checking brood (pupae) for mites is a reliable detection method. The adult mites can be easily seen against the white surface of worker or drone pupae after they are removed from the cells. It is suggested that at least 100 pupae per colony be examined for an adequate survey. An individual pupa can be removed from its cell with forceps or groups of pupae removed from their cells by inserting a capping scratcher at an angle through the cappings and lifting the brood and cappings upward. Bee Washes - Collect about 300 adult bees from the brood nest into a jar filled with detergent-water or alcohol. Place a lid on the jar and shake vigorously for about a minute; then pour the bees and solution through a double screen or sieve. The upper screen should filter out the bees while the lower screen will catch the mites. A white drip coffee pot filter used on the second screen to catch varroa mites works fine. Repeat the solution wash for a thorough survey. The beekeeper may then count the bees and mites and estimate a mite to bee ratio for the colony. Mite Fall Examination - This technique requires a piece of sticky white construction paper be placed on the hive floor. The paper surface may be made sticky by applying petroleum jelly, cooking oil spray or Tangle Foot. The mites will naturally fall from the bees in the hive and be trapped in the adhesive material. A screen of 1/8 inch hardware cloth must be placed 1/4 inch above the sticky paper to prevent bees from becoming en-tangled on the trap or allowing bees to remove mites from the trap. Commercially produced frames to exclude bees, the Varroa Trap and the Beltsville Screen Insert, are available through bee supply stores or a beekeeper may con-struct a similar frame. The sticky paper is removed after 2-3 days and can be easily examined for trapped mites. A magnifying glass or dissecting microscope may be helpful in counting mites if heavy debris is present on the trap. This is a very sensitive method of mite survey when the colony is broodless. Mite fall counts can be increased using an approved acaricide treatment during the survey. Laboratory Confirmation - Beekeepers may mail bee samples (100 adult bees) to the USDA Bioenvironmental Bee Lab, Building 476, BARC-E, Beltsville, Maryland, 20705 to test for the presence of mites. The mite level will not be estimated. The bees should be placed in a small sealed container with enough alcohol to cover the bees. The container should be mailed in a cardboard box with adequate packing to prevent breakage or accidental leakage. Any sample of brood in comb should be wrapped with paper and shipped dry in a cardboard box. When shipping samples always indicate the owners name, address, county, apiary location and collection date. Beekeepers must accept the fact that varroa mite eradication is not possible. We must aim at avoiding pest damage levels using highly effective means of control. Beekeepers are urged to attend local, state and regional beekeeper meetings to stay abreast of the latest varroa mite control recommendations. Beekeeping journals are another good source of current information on how to control varroa. There are many varroa mite control methods available to the beekeeper. Some have been shown to be only moderately effective. An integrated approach to varroa mite control that includes cultural, chemical, and use of resistant lines of bees is best. Cultural Control - The removal and destruction of infested bee brood, especially drone brood, having mites has proven to reduce varroa problems, but this method is labor intensive and reduces colony strength. Confining the queen to a cage inside the hive and creating a broodless period may break the varroa life cycle, but this method will also stress the colony. The use of the Beltsville Screen Insert which is a bottom board modification with screen slows the growth rate of varroa, but it does not control the mites without the use of other control measures. Chemical Control - Beekeepers should use only pesticides which are registered for use in your state by EPA for varroa mite control. A pyrethroid, fluvalinate, is fully registered under the name Apistan™ in the US and an organic phosphate, coumaphos, under the name of Bayer Bee Strip or Check Mite+ ™ is registered in most states under an emergency use label only. Both products are available, but no longer recommended because of build up in wax over time becoming toxic to the colony. Formic acid and oxalyic acid are now the most comonly used products in controling varroa mites. Mite away quick strips (formic acid) are hung vertically between hive frames so that the bees and mites come in contact with the chemical. The strips have enough active ingredient to kill the small mites, but do not affect the larger sized bees. Beekeepers should follow label instructions exactly on these products and remove strips in a timely manner to avoid mite resistance to the product and honey contamination. Most products should not be used during a nectar flow and never use more than one product in a hive at the same time. Varroa mites have shown resistance to fluvalinate. 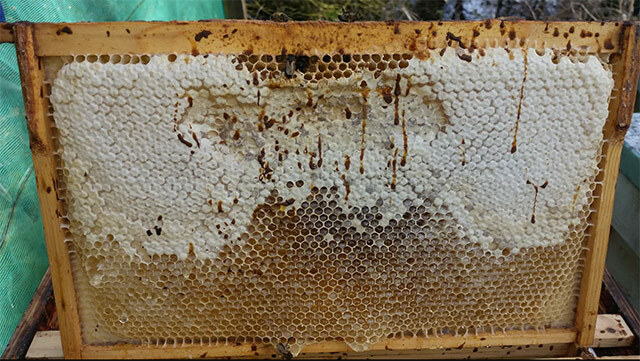 Possible reasons for the resistance problem are the long term use of a single product to kill varroa mites, beekeeper failure to remove pesticide strips in a timely manner, and misuse of pesticide products not labeled for varroa control. Resistant Bee Lines - The use of selected lines of bees that show mite resistance is a preferred method of control. Only a moderate level of varroa resistance has been reported. Varroa resistance may come in the form of bees that show a grooming behavior, hygienic behavior, or shortened brood period that disrupts the life cycle of mites. Organic Oils - The use of botanical or essential oils such as Thymol and Mineral oil may reduce varroa mite numbers. Most require an integrated approach along with other control measures to maintain healthy bee colonies. Some applications of these naturally occurring oils may be detrimental to the colony, causing queen failure or significant loss of worker bees. Additional research is needed to develop application methods of botanical oils for mite control to prevent negative effects on bee colonies. Galleria mellonella (greater wax moths) do not attack the bees directly, but feed on the wax used by the bees to build their honeycomb. Their full development to adults requires access to used brood comb or brood cell cleanings—these contain protein essential for the larval development, in the form of brood cocoons. The destruction of the comb will spill or contaminate stored honey and may kill bee larvae. When honey supers are stored for the winter in a mild climate, or in heated storage, the wax moth larvae can destroy portions of the comb, though they will not fully develop. Damaged comb may be scraped out and replaced by the bees. Wax moth larvae and eggs are killed by freezing, so storage in unheated sheds or barns in higher latitudes is the only control necessary. Because wax moths cannot survive a cold winter, they are usually not a problem for beekeepers in the northern U.S. or Canada, unless they survive winter in heated storage, or are brought from the south by purchase or migration of beekeepers. They thrive and spread most rapidly with temperatures above 30 °C (90 °F), so some areas with only occasional days that are hot rarely have a problem with wax moths, unless the colony is already weak due to stress from other factors. A strong hive generally needs no treatment to control wax moths; the bees themselves kill and clean out the moth larvae and webs. Wax moth larvae may fully develop in cell cleanings when such cleanings accumulate thickly where they are not accessible to the bees. Wax moth development in comb is generally not a problem with top bar hives, as unused combs are usually left in the hive during the winter. Since this type of hive is not used in severe wintering conditions, the bees are able to patrol and inspect the unused comb. Wax moths can be controlled in stored comb by application of the aizawai variety of Bacillus thuringiensis spores by spraying. It is a very effective biological control and has an excellent safety record. Wax moths can be controlled chemically with paradichlorobenzene (moth crystals or urinal disks). If chemical methods are used, the combs must be well-aired for several days before use. The use of naphthalene (mothballs) is discouraged because it accumulates in the wax, which can kill bees or contaminate honey stores. Control of wax moths by other means includes the freezing of the comb for at least 24 hours. Nosema apis is a microsporidian that invades the intestinal tracts of adult bees and causes nosema disease, also known as nosemosis. Nosema infection is also associated with black queen cell virus. It is normally only a problem when the bees cannot leave the hive to eliminate waste (for example, during an extended cold spell in winter or when the hives are enclosed in a wintering barn). When the bees are unable to void (cleansing flights), they can develop dysentery. Nosema disease is treated by increasing the ventilation through the hive. Some beekeepers treat hives with antibiotics such as fumagillin. Nosemosis can also be prevented or minimized by removing much of the honey from the beehive, then feeding the bees on sugar water in the late fall. Sugar water made from refined sugar has lower ash content than flower nectar, reducing the risk of dysentery. Refined sugar, however, contains fewer nutrients than natural honey, which causes some controversy among beekeepers. In 1996, a similar type of organism to N. apis was discovered on the Asian honey bee Apis cerana and subsequently named Nosema ceranae. This parasite apparently also infects the western honey bee. Exposure to corn pollen containing genes for Bacillus thuringiensis (Bt) production may weaken the bees' defense against Nosema. In relation to feeding a group of bees with Bt corn pollen and a control group with non-Bt corn pollen: "in the first year, the bee colonies happened to be infested with parasites (microsporidia). This infestation led to a reduction in the number of bees and subsequently to reduced broods in the Bt-fed colonies, as well as in the colonies fed on Bt toxin-free pollen. The trial was then discontinued at an early stage. This effect was significantly more marked in the Bt-fed colonies. (The significant differences indicate an interaction of toxin and pathogen on the epithelial cells of the honeybee intestine. The underlying mechanism which causes this effect is unknown.)" This study should be interpreted with caution given that no repetition of the experiment nor any attempt to find confounding factors was made. In addition, Bt toxin and transgenic Bt pollen showed no acute toxicity to any of the life stages of the bees examined, even when the Bt toxin was fed at concentrations 100 times that found in transgenic Bt pollen from maize. Comb slimed by hive beetle larvae: Hives infested at this level will drive out bee colonies. Aethina tumida is a small, dark-colored beetle that lives in beehives. Originally from Africa, the first discovery of small hive beetles in the Western Hemisphere was made in St. Lucie County, Florida, in 1998. The next year, a specimen that had been collected from Charleston, South Carolina, in 1996 was identified, and is believed to be the index case for the United States. By December 1999, small hive beetles were reported in Iowa, Maine, Massachusetts, Minnesota, New Jersey, Ohio, Pennsylvania, Texas, and Wisconsin, and it was found in California by 2006. The lifecycle of this beetle includes pupation in the ground outside of the hive. Controls to prevent ants from climbing into the hive are believed to also be effective against the hive beetle. Several beekeepers are experimenting with the use of diatomaceous earth around the hive as a way to disrupt the beetle's lifecycle. The diatoms abrade the insects' surfaces, causing them to dehydrate and die. Several pesticides are currently used against the small hive beetle. The chemical fipronil (marketed as Combat Roach Gel ) is commonly applied inside the corrugations of a piece of cardboard. Standard corrugations are large enough that a small hive beetle can enter the cardboard through the end, but small enough that honey bees cannot enter (thus are kept away from the pesticide). Alternative controls such as oil-based top-bar traps are also available, but they have had very little commercial success.